White Pine occurs throughout the country, North and South Islands, mostly in swampy areas. Its timber is very light in colour, and was one of the most useful of New Zealands soft woods. Male and female flowers are borne on separate trees. After fertilization they get the swollen flower stalk that gives rise to the first part of their botanical name, as described in the totara page. Kahikatea has a few problems when it comes to bonsai, for one it is difficult to get to branch at a young age, in its natural form the tree can reach 60m tall and have an unbranched trunk for almost 25m of that height. This can be overcome by removing the top of your tree. They will produce shoots from the trunk and these shoots will eventually produce branches. The second problem is they have a juvenile needle that is bronze in colour and to the uninitiated makes the tree look sick or dead. On close inspection it is obvious that it isn't and it in fact makes a lovely contrast of colour in my collection. With these two problems in mind the White Pine makes a wonderful bonsai especially as a group planting. Once the foliage becomes mature, which can take quite a few years it is not unlike a Cypress. Kaihikatea grows naturally in wet areas so your bonsai should be kept damp at all times. It also helps if they are grown in a shady area especially when young. After initial shaping pruning should be kept to pinching much as you would a cypress. By pulling the tips of the foliage until they come away you maintain a bushy plant that will improve every year. 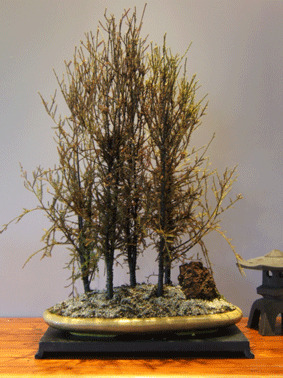 I have never had any problems with kaihikateas as bonsai. I have in the wild seen them covered with sooty mould. This is a secondary infection that looks like black soot on the branches and leaves. It can nearly always be seen on wild manuka. It is in fact a black mould that grows on the sticky excretory substances of insect pests. Your best method of control is therefore control the pest this will eventually eliminate the food source for the fungus.